Special Thanks to Michael Collier, Jennifer Grotz, Noreen Cargill, Jason Lamb and Camille T. Dungy for giving me the chance to be part of Bread Loaf Writers’ Conference 2015, and for making me feel I belong to this great family. I also want to thank all of the people who supported and helped me financially and emotionally to get to the Bread Loaf Writers’ Conference 2015. 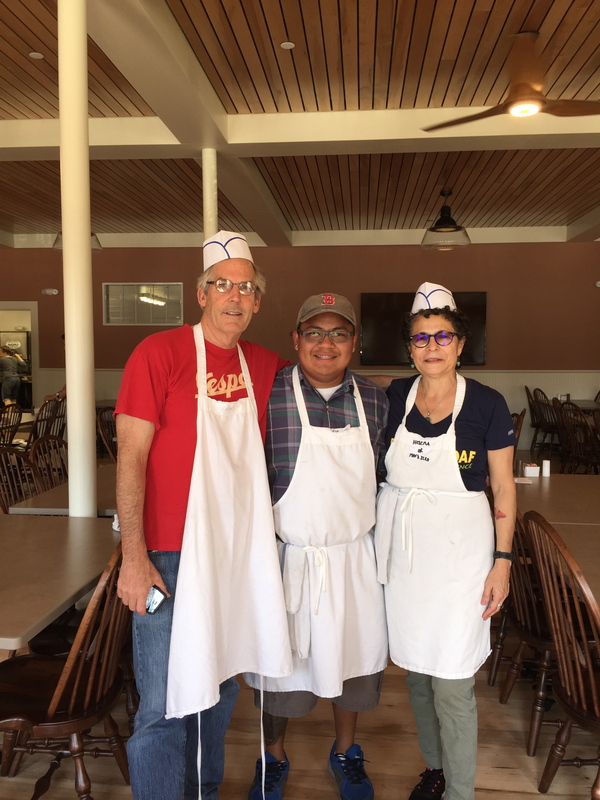 What did I gain as part of Bread Loaf Writers’ Conference? The knowledge and the inspiration are unique and great. Having the opportunity to share this unique experience and place with the most outstanding writers in the country has been a great experience that can only be summoned to one word, inspiration. By writing about my experience as a Work-Study Scholar (aka Waitership), I am trying to expressed ideas and feelings as I believe Bread Loaf Writers’ Conference has made a great impact in my personal and professional life. My experience as a Work-Study Scholar was a unique. I hope every body can have the same opportunity to experience the Bread Loaf Writers’ Conference at some point in life. Even though, my team and I worked three or four meal shifts per day, we were able to find energy to go out and be part of the many craft classes, workshops, readings and social events. I found myself sleeping for five hours or less and getting up when the campus bell was rang for breakfast (7:30am). My workshop leader had warned me, “You as a waiter have to prioritize. First work and workshop and then if you can go to the other events.” I can go on about the many things that my team and I went through, good and bad, exciting and frustrating, but I guess this whole experience taught us to bound and to build a community of waiters-writers-human beings-dreamers. There is no time in the Mountain for self-pity, or time to waste with nonsense. On my first day, I took a nice hiking trip around Middlebury College. Hiking pays off because I met a great writer and professor, who taught me how to understand the ins and outs of Bread Loaf Writers’ Conference. This professor was walking on the street by herself. I was happy to see this person walking alone because I have gotten myself lost while looking for Robert Frost’s cabin. I approached this professor and asked for directions. I didn’t think about this, but after a while, I thought about it carefully, she must be afraid of me, a brown man holding a wooden stick mumbling to myself how stupid I was for not finding Robert Frost’s Cabin. Indeed, this professor admitted to me later on that she was afraid of me, and that she wanted to grab a rock just in case. Good thing she didn’t find a stone because she might have used it on me. I feel happy because this professor was willing to help me coupe with the active Bread Loaf Writers’ Conference’s life. Also this professor couched me how to read my poems out load, a teaching lesson I won’t ever forget. Every time, I feel like my journey as a writer and Poet has reached its end, or whenever I feel I have no energy, something always happens that shows me there is still hope. This time, Bread Loaf proved me that there is still hope even for me. I am trying to understand my role as a Bread Loaf Scholar. Now, I like to think of myself as an Ambassador of Bread Loaf’s believes. This tittle implies a great deal, and I am not assuming to know the right answers for Bread Loaf Writers’ Conference at all, but after ten days at the Mountain, my life has been changed. Now, I can say I belong to a great family of writers. At that moment, I felt like I didn’t belong here or there. One more time in my life, I felt like my world has become part of a bubble of ether. How can ten days at the Mountain have so much power to change me? This is the magic of being isolated and sharing ideas, meals and rooms with the best writers I have ever met. This is what breathing that muggy air of the Vermont Mountain can make to people who have never belong to a community of writers before. Redwood City, CA. August 28, 2015. Gerardo. You have a gift. I have been a voracious reader since I was quite young. I am particularly drawn to poetry and have been fortunate to have read, studied and known some great poets. They have nothing over you. Your voice, your history and your poetry are distinct and absolutely that of a great artist. Nothing should turn you away from your writing. Ever. It is okay to be unsure about how to handle the realities of how to survive but I urge you not to let anything lead you away from your writing. I would venture to suggest it is the gold nugget center on which the rest of your life can revolve. You are that good. I am forever waiting to here/read the next poem of yours. thanks Nancy, I am glad to have ever got to know you. Your words and support have always been a great motivation to keep on writing indeed. Thanks again and have a wonderful weekend.